Resource center Drug Recovery Process and Timeline How Can a Dietitian Help in Drug Recovery? According to the book Practical Skills and Management of Alcoholism and Drug Addiction, chronic abuse of drugs or alcohol can affect the body directly by altering brain pathways or producing direct tissue damage, such as cirrhosis of the liver, and by the person engaging in negative lifestyle practices, such as having a poor diet. There are specific issues associated with certain types of drug use that are related to nutritional issues. Chronic use of alcohol can result in a person developing a number of vitamin deficiencies. Most often, vitamin deficiencies occur as a result of chronic alcohol abusers neglecting their diet. The most common vitamin deficiencies in individuals who have moderate to severe alcohol use disorders are deficiencies of B vitamins, such as folic acid, vitamin B6, and vitamin B1. A common syndrome associated with poor diet in chronic alcoholics is Wernicke-Korsakoff syndrome, which is a result of a lack of vitamin B1. The poor dietary practices often found in chronic alcoholics results in issues with memory, nystagmus, and walking. If the syndrome is recognized early enough, vitamin supplementation and a balanced diet can reverse its effects; if not, the effects may be permanent. Chronic alcohol use can often affect other organs in the body: the liver and the pancreas. Damage to these organs can result in a number of issues that include cirrhosis of the liver, diabetes, shortened life expectancy, and severe malnutrition. Chronic opiate abuse (heroin, morphine, OxyContin, Vicodin, etc.) results in severe constipation. During withdrawal from opiates, nausea, vomiting, and diarrhea are common. Both syndromes may lead to an individual not getting proper nutrition and to electrolyte imbalance. Individuals may suffer chronic dehydration or malnutrition as a result of withdrawal or lack of appetite due to chronic opiate abuse. Abuse of stimulant drugs, such as cocaine and methamphetamine, can lead to severe reductions in appetite, weight loss, and malnutrition. Chronic users of stimulants may not sleep for days and may become dehydrated or develop severe electrolyte imbalances during bingeing episodes. Chronic use of stimulants like methamphetamine has also been associated with cognitive problems, such as memory loss. Chronic users of cannabis products often suffer the opposite effects that occur with chronic stimulant abuse. These individuals may develop extreme hunger and binge on foods that have poor nutritional content, leading to a number of potential issues with malnutrition or obesity. Nutritional therapy for substance use disorders is a complex and somewhat controversial approach to treatment. Certainly, the importance of good nutrition cannot be understated, and this is also true for individuals who have substance use disorders. While engaging in certain types of diets and nutritional strategies is not designed to be a mainstream or standalone approach to substance use disorder treatment, nutritional therapy can help individuals with recovery and produce positive effects. The dietitian’s role is to educate the person in recovery regarding how to eat a balanced diet and what types of vitamin supplements to take, and then supply them with appropriate balanced meals. 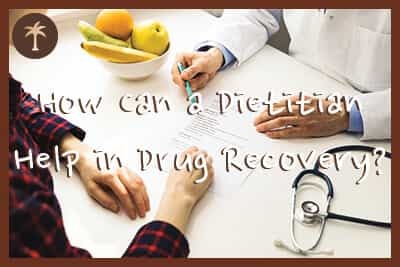 During the initial stages of withdrawal management, this may be difficult due to individuals having poor appetites or not wanting to eat at all; however, as the individual begins to recover, the role of diet becomes increasingly more important. Physician-assisted withdrawal management, or medical detox, is a program designed to assist individuals in negotiating the withdrawal process from drugs or alcohol. Physicians may administer some form of medication, such as an opioid replacement medication (e.g., methadone or Suboxone) or a benzodiazepine (e.g., Valium or Librium), to reduce the symptoms of withdrawal and to reduce any potentially dangerous complications that can occur during the withdrawal process from alcohol or certain drugs. Some of these medications may produce side effects, such as constipation, appetite abnormalities, or weight gain. Some may directly influence digestion and appetite. The side effects associated with these medications may produce other complications and may even trigger a desire to relapse. Dietitians can be utilized during withdrawal management to ensure that clients remain hydrated, receive proper nutrition, and deal effectively with changes in appetite or with constipation. A Dietician helps to prepare balanced meals and encourage them to eat at regular intervals can foster the development of positive physical and mental wellbeing. This can reduce the effects of emotional states that can act as triggers. When used in conjunction with formal therapy, pharmacotherapy (the use of medicines), and social support, nutritional therapy can be a useful addition to a recovery program. There is a strong relationship between being diagnosed with a substance use disorder of any type and having some other mental health disorder. There is an increased probability that an individual with a substance use disorder will be diagnosed with any other type of mental health disorder; however, two of the most common disorders associated with individuals with substance use disorders are clinical depression and anxiety-related disorders. Before an individual begins the recovery process, a number of neurotransmitters in the brain may be at low levels due to the effects of substance abuse and poor nutrition. These nutritional deficiencies can exacerbate issues with depression, agitation, anxiety, and other psychological symptoms. Nutritional therapy can be used, along with other forms of therapy and exercise, to help restore the balance of neurotransmitters in the brain. Dietitians can ensure that an individual in the early stages of recovery is receiving proper nutrition, vitamin supplementation, hydration, etc., which can facilitate restoration of the balance of neurotransmitters and hormones in the individual’s system. Metabolic syndrome is a collection of different conditions that increase the risk of developing heart disease, stroke, and diabetes. Chronic substance abuse, especially chronic alcohol abuse, is associated with an increased risk of developing metabolic syndrome. Substance abuse contributes to developing metabolic syndrome due to increased damage to the cells in organs, such as the liver and kidneys; a reduced antioxidant potential throughout the system; reduced energy; an increase in excitotoxicity (a pathological process in the brain where neurons are destroyed as a result of overactivation of the excitatory neurotransmitters [glutamate]). A number of studies have reported a high prevalence of metabolic syndrome in individuals with substance use disorders. Nutritional therapy can institute dietary changes to reduce blood pressure and cholesterol, encourage the individual to get involved in exercise, and foster weight loss to reduce the potential to develop serious conditions, such as cardiovascular issues and diabetes. One of the best ways to avoid the development of metabolic syndrome is to ensure that the individual’s diet is properly balanced and the person is getting proper nutrition. Nutritional therapy, provided by a dietician, is a useful adjunctive therapy that can improve the recovery process for individuals with substance use disorders. While individuals who suffer from substance use disorders should participate in empirically validated substance use disorder therapies, nutritional therapy offers significant potential to increase the effectiveness of these traditional approaches. Dieticians can be useful for clients in recovery. They can help clients avoid relapse and gain a full and holistic approach to recovery.